The international network of which we are a part of, Connect International, is implementing a major international project „UpDatAed – Towards digitaly safe youth organizations”. Its implementation has started with a preparatory meeting that was held in Brussels, Belgium, from 15th till 18th of March 2019. The main goal of this project is to create sustainable systems for ensuring rights protection, safety and privacy of young people in youth organization programs. 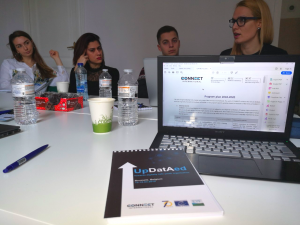 Team members and representatives of partner organisations which are working together within the CONNECT International on this project have discussed the future activities which will ensure the proper and efficient implementation of the UpDataED project during this year. Partners were introduced to all phases and aspects of the project in detail and after which they set solid base for project to run smoothly and according to NFE quality standards. In order to prepare for the second major activity within the project, which is a Seminar aiming to create learning path for organizations willing to apply data protection standards in their work, a two parallel researches are going to be conducted over the following months. They will serve to learn more about mistakes we see being done when it comes to data protection through youth work and the impact of different situations that have caused violation of rights of participants of youth activities. The findings of these researches will serve for development of the methods and techniques that will insure the protection of privacy, identity and sensitive data in youth organizations. The project „UpDatAed – Towards digitally safe youth organizations” is co-funded by the European Youth Foundation of the Council of Europe and Friedrich Naumann Foundation for Freedom.